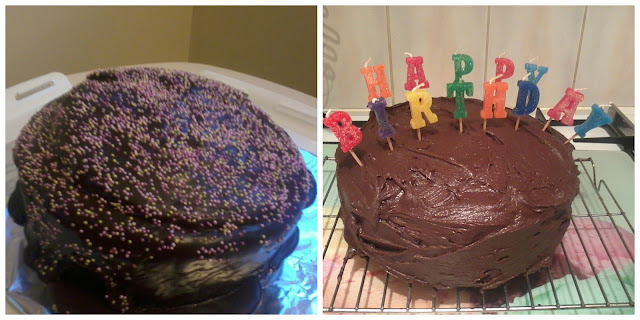 Several years back, I found a vegan chocolate cake recipe on the Pure Dairy Free website. This recipe is my go to for all occasions and I have had many requests from non-vegans to make it for them. No one ever believes me when I explain it is free from dairy and egg. Pure recently updated their website and the recipe has disappeared. I wanted to share it here on my blog because I can no longer direct people to the link. I love this recipe because the cake tastes amazing but there are no strange ingredients and you don’t even need a milk substitute. Preheat oven to 1600c/gas mark 6, grease the tin with oil or margarine, line the base with parchment. To make the cake - Place the Chocolate Cake ingredients (listed above) in a bowl and mix to make a smooth batter. You can do this by hand or with an electric mixer. My one tip is sieve the flour as I always feel that makes for a nice soft sponge. Pour the batter into your cake tin, smooth the surface and bake for 45 mins or until a knife inserted into cake comes out clean. Leave in tin to cool and turn out onto a wire rack. Once cold you can cut in half so you can put the chocolate fudge in the middle but I often do not bother and instead smoother the outside with the chocolate fudge. To make the Chocolate Fudge – Gently melt 50g of Pure Spread with water in a pan. Remove from heat then add cocoa powder and icing sugar and beat until smooth. Allow to cool until firm enough to spread on cake. If you cut the cake in half then use two thirds of chocolate fudge to fill the centre and the remainder as topping.